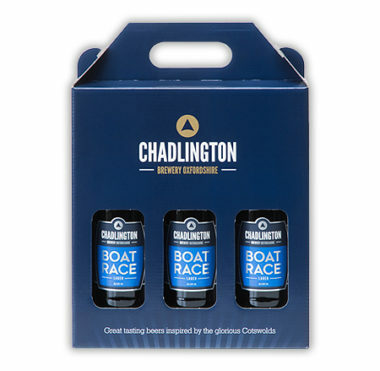 Contains 3 x 330ml bottles of Boat Race Lager (5.0% ABV) in a sturdy gift box with integrated handle. Contains 3 x 500ml bottles: Oxford Blue Ale (4.2% ABV), Oxford Blonde Ale (4.0% ABV) and Golden Ale (4.0%) in a gift box with integrated handle. Contains 3 x 500ml bottles: 2 x Oxford Blue Ale (4.2% ABV) and 1 x Oxford Blonde Ale (4.0% ABV) in a gift box with integrated handle. Contains 3 x 500ml bottles: 2 x Oxford Blonde Ale (4.0% ABV) and 1 x Oxford Blue Ale (4.2% ABV) in a gift box with integrated handle. Contains 3 x 500ml bottles of Oxford Blue Ale (4.2% ABV) in a sturdy gift box with integrated handle. 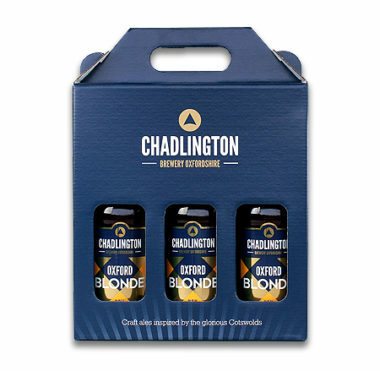 Contains 3 x 500ml bottles of Oxford Blonde Ale (4.0% ABV) in a sturdy, gift box with integrated handle. Contains 3 x 500ml bottles of Golden Ale (4.0% ABV) in a sturdy, gift box with integrated handle.